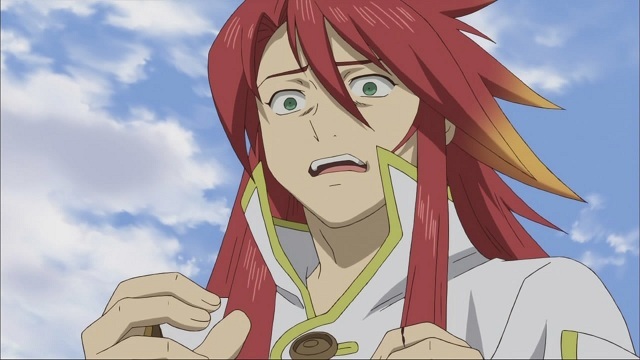 For this Building Character we’ll be looking at the main character from Tales of the Abyss, Luke Fon Fabre. Luke is the son of a duke and the nephew of a king. Although being royalty is not an odd thing for a main character, Luke is not, for example, like Estelle from Tales of Vesperia, who’s an out of touch but compassionate individual. Luke isn’t someone who sets out to help others. Instead he is selfish, full of himself, and condescending. It’s pretty easy to dislike him at the beginning, something the game’s producer intended. Luke however hasn’t had a perfect life. He was kidnapped as a child which resulted in him remembering nothing before the event and he’s not allowed to leave his mansion. Though that doesn’t give him an excuse to be a jackass. Although cut off from much of the world, Luke becomes entangled in the coming conflict between two kingdoms. One day an intruder appears and attempts to kill Master Van, Luke’s mentor. After intervening Luke ends up stuck in a foreign land away from his mansion and finds himself having to rely on the intruder, named Tear. Tear is the first person Luke has really talked to outside of the mansion and has no issue telling him of the faults in his personality. It’s no exaggeration to say that they do not care for each other when they first meet. Tear isn’t afraid to tell Luke what she thinks and the different things wrong with him, which of course annoys our selfish protagonist. While Luke isn’t that pleasant to be around he does have some redeemable qualities which show up when he starts his journey with Tear. As time passes, others begin to join up with Luke and Tear. One of them is Mieu, who fills the role of mascot character. While Tear adores him, Luke does not find him endearing and actively mentions how much he dislikes Mieu. For much of the story he address him as “thing”. Even with Luke’s insults and threats, Mieu is extremely loyal to him and believes he is a good person. Some more time passes and it seems things are beginning to go well. Luke is (slowly) beginning to be less of a jerk, and he even becomes an ambassador between the two countries. Unfortunately, he still isn’t all that different from before he left the mansion. At one point Luke and the others set out to help a town when Van tells him what has to be done. Luke does not question it. He doesn’t believe he or Van could be wrong. Tear warned him multiple times not to trust him but he doesn’t listen. The result ends in disaster, causing the loss of an entire town and everyone in it. Luke realizes he was just a tool, blinded by his admiration for Van. The loss of the town’s people is on him. He didn’t set out to destroy the town, but he was unwilling to listen to Tear and see what would happen. Even though the rest of his group knows that he set out with good intentions, they don’t hesitate to tell him he’s the reason it happened. 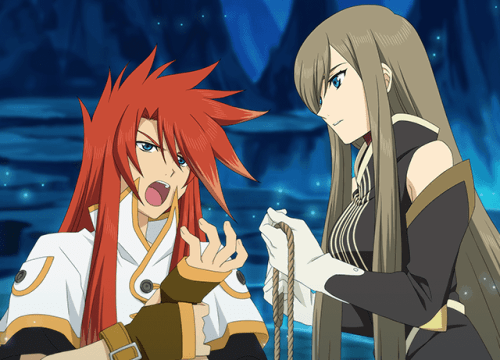 To add on to that event, Asch, a character who’s been antagonistic to Luke the whole time, reveals the truth regarding his kidnapping. Luke is a replica, cloned from Asch who is the real Luke. He then was sent back to take Asch’s place to be of use for Van one day. Luke was born to be nothing more than a tool for Van. With what has happened the others lose faith in Luke, leaving only Mieu standing by his side. With no one else to turn to he goes to Tear and asks her to watch over him as he promises to change himself. She agrees that she will offer her support. Luke understands that no matter what he does he can’t bring the town and the people back, but takes responsibility for what has happened. 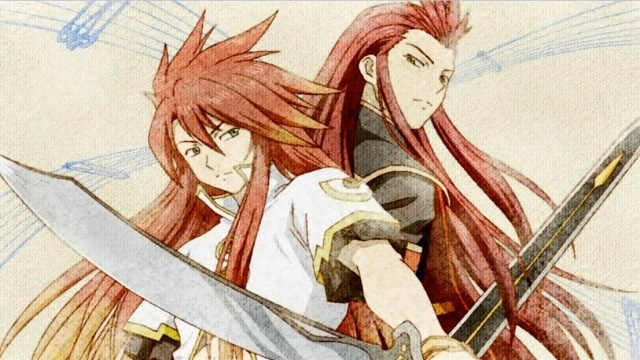 Although a copy of Asch, they both make it clear that they are not the same person, with Asch going on to say that he is no longer Luke anyway. 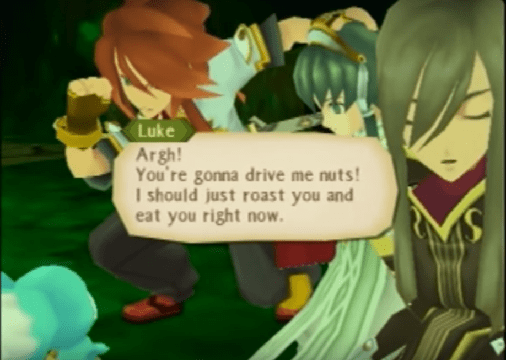 Eventually Asch acknowledges Luke as a person and not just a copy. After making his promise to change, Luke sets out to stop Van’s plot at any cost. What sets Luke apart from other protagonists is the growth that he experiences during his journey. He’s a spoiled brat that eventually has to face the reality that not everything is about him, along with consequences of his bad decisions. It’s when he comes to understand he can’t be the same selfish individual that he begins to take on the role of a hero. 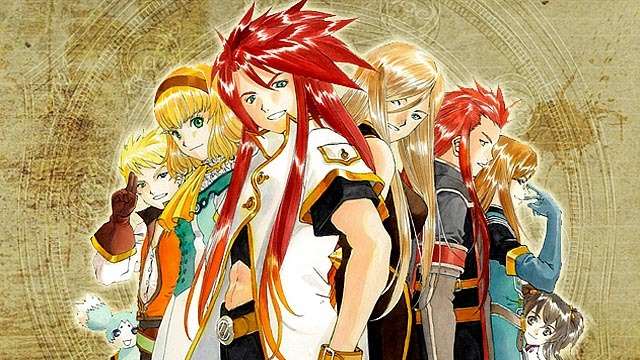 Tales of the Abyss was originally released on the PlayStation 2 and is now available on the 3DS. There is also an anime adaption.